Oy! The Blog Gods are not letting me edit my post to include the link to Jenn's fab blog The Cottage Nest...check it out here! I love Jenn's photo, and I love, love, love your kitchen, Linda. Man, I need some pet artwork! Hello, I love your kitchen. It makes me want to redecorate mine. You have a very nice blog. I enjoyed reading this post. Have a nice afternoon. I adore your blog. I just found it via Blue Mango. What a talent you are. I must come by to visit again soon. P.S. I grew up in North Miami Beach. Have not seen a lizard since. I hope you can stop by my blog sometime. I'm at Sunbonnet Cottage. Hope to visit again soon. I love your doggie pics and I adore your doggies. I miss having wet-nosed doggy kisses :( Your kitchen is tres chic and your blog is fabulous. My dad is from Miami, so I spent a lot of time there as a child. Your pictures are often a jog down memory lane. Have you seen the Blue Dog pics for New Orleans? They were quite popular when we live in Louisiana. If I had your kitchen, Linda, I'd live in mine, too! 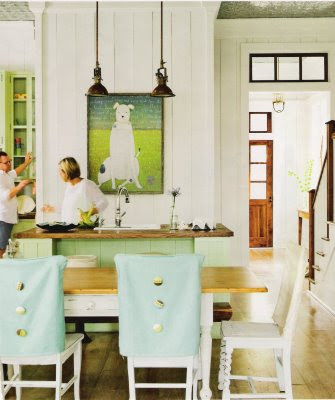 :-) Love the dog art, love the white cabs, the counters, the sink, the dishes, the rug...need I go on? You've got the touch! OK...that black and white picture needs to be in the pool...the pool of prizes for BI. How adorable is that picture!! I want it. Let's trade. Great picture of your kitchen...it just keeps getting better and better. Oooooooooh, I know. How about you share one of your dishes that you whip up in that gorgeous kitchen of yours? GREAT BLOG!!!! I love it!! Catherder...at first i read your name as catheder...I get it now! Thanks!!! Sarah White...why that is a stellar idea! That B&W face is a cutie, eh? Amber..I mis-spoke, not so much live IN it as LIVED-IN. But thankyou! Karin and Jenn...Miami is probably a bit different now. We are pretty far from it...What a HUGE city! Melissa...and I ADORE Blue Mango...I will certainly head over to your blog...has a happy name! Sandra...yes, get you some pet artwork...stat! Sigh... your kitchen is fantastic. That sink is pure heaven, and thank GOODNESS someone else actually puts dishes in their sink. :) Makes me respect you more! Great kitchen! I adore the doggie pics! What a fabulous kitchen! You have exquisite taste.